Little is known about the history of candles but it goes as back as 5000 years ago when candles were used in traditional ceremonies. The earliest candles were made and used by the Egyptians. Although the candles made by the Egyptians are not the conventional candles we use today. These candles were mostly made with animal fat without a wicked. Later, the Romans officially made candles from beeswax. These candles were used to aid their travel and light up their homes. Candles have been made out of various fats, oils and waxy substances. These days most of the candles are made from regular wax, soy candle, beeswax and palm tree soy. One of the decisions you will make before buying or making a candle yourself, is to know the wax for the candle. With the diversification in every product, you get the option for synthetic as well as natural wax. You even get candles which are a mixture of both the waxes. Paraffin wax is the most commonly used wax these days. It can help make any kind of candle be it the simple candles or the fancy ones. The commercial candles we see are all made of paraffin. Paraffin is a by-product of the of the crude oil refinement process. Soy wax is another type of wax. It has been the most famous wax type. People are turning to natural ingredients these days. For this reason, soy wax has become the most used wax and was first introduced in 1990 as an alternative to the petroleum based paraffin. So how is soy wax made? Soy wax comes from soybean oil and is 100% natural. Beeswax is the oldest wax which was found in the Egyptians pyramids. Beeswax is a by-product that comes from honey making process. As this wax is extracted from honey comb, they naturally get infused with honey and has a sweet fragrance. Like soy wax, palm wax is also a similar type. It is made from palm oil. 75% of the world palm oil is used in food products and the rest is used for making candles. Candles.org has estimated that Americans spend around $3.2 billion on candles every year. We often wonder why these candles are so expensive. While we come across candles which are very cheap comparatively. The reason is simple. Expensive candles are made from premium materials such as soy wax or palm wax. The scents used in these candles is also very costly making the end product very expensive. But there are cheap candles as well. They are mostly made with substandard materials and so they do not last long. Some companies sell their candles at a higher price giving an impression that their product is premium and luxury item. With the amazing variety available for candles, some of the companies have taken it to a different level. Fornasetti is one of them. They not only make very attractive candles but there scent is amazing as well. There candle jars are one of their exclusive feature and not to forget the fragrance. Sisley Paris makes up our list as well. If you think this brand is only for makeup and perfumes, you are wrong. They sell candles as well. They come up with limited edition candles and you need to grab them before they are out of stock. Eight & Bob comes third in our list. They have a wide variety of home fragrances and candles that can light up your mood. Lumira is a great brand too. There candles are not just average candles but they come up with essential oil essence to relax your senses. These candles are gaining a lot of popularity due to their health benefits. Candle production is a booming industry these days. One of the reasons that more and more people are ready to invest in this business is due to the high and never ending demand. Most of the investors prefer to invest in everyday products but as candle industry is a growing one and has a lot of profit margin, it will always be a preference for many investors. This business can be started with as little as $5,000 or even less. The candle making process is easy and does not require a lot of labor. Less capital and no or minimum labor cost are good reasons to start this business. As the investment is less, the risk of loss and failure remains less as well. Even if you are using premium quality products, the profit margins are still very high. Although the demand for candles never decreases, but during festivals such as Halloween, Christmas and New Year, the demand increases drastically. Candellana Candles makes high quality, minimalistic shaped candles. Apart from most players in the market, Candellana focus on bringing unique detailed design mixed with the functionality of candles, making a perfect gift for those who love creative surprises. All candles are made in Europe and unlike its competitors,use 100% natural raw material to ensure a great non-toxic and clean burn. 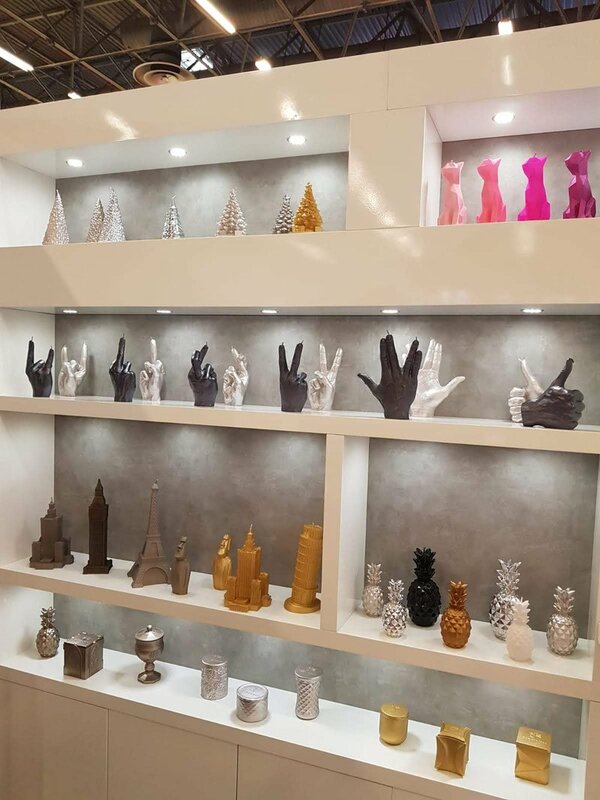 The most famous collections include Dog and Cat Poly shaped candles, skull candles, real size hand gestures- such as the world famous middle finger and finally the new launch of scented candles hand poured in concrete vessels.